During the month of October, our Pastors in this District reported a total of 257 baptized and 141 that received the baptism of the Holy Spirit. We want to thank everyone for your prayers. Continue to pray for revival in Mexico! The churches have launched several evangelism campaigns across the capital city. There were 300 plus children in attendance at a special service. What an overwhelming experience to hear Muslim children singing about Jesus. The student pastors held a crusade, and 150 plus people attended. 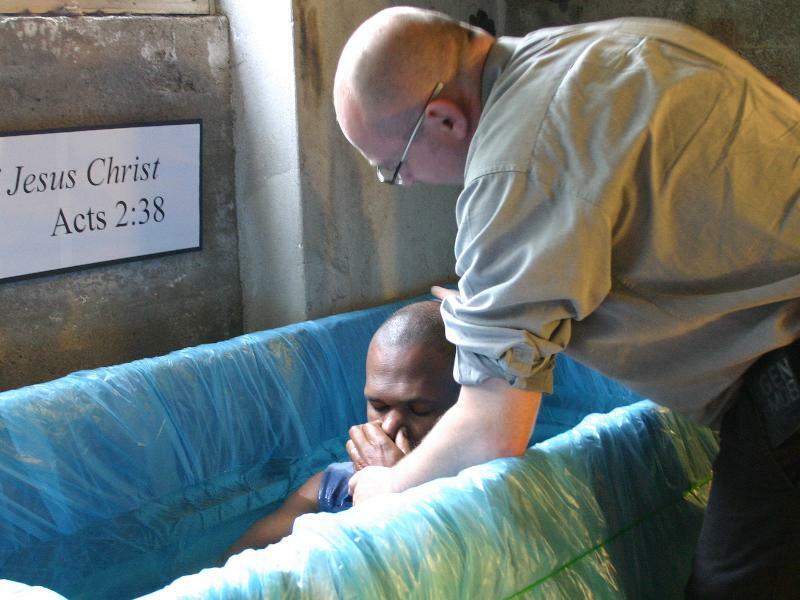 Many repented, and five were baptized in Jesus' name. One pastor held a special evangelism event that resulted in several being baptized in Jesus' name. In the Bible School, eight students received their Certificate degrees through the Global Association of Theological Studies (GATS) program. They are continuing their education with the diploma level. The Minister's and Wives Conference was blessed with forty-six ministers and their wives in attendance. At National Convention seven were baptized in Jesus' name and six received the baptism of the Holy Spirit. Recently, nine received the baptism of the Holy Spirit. One baptized in Jesus' name. A total of ten received the baptism of the Holy Spirit during services attended by missionaries. One of the local churches had an effective leadership seminar. Throughout the country, a total of forty-one Bible studies were taught, 118 were baptized in Jesus' name, sixty-two received the baptism of the Holy Spirit, and ninety-one claimed healing. There were also three new preaching points established. 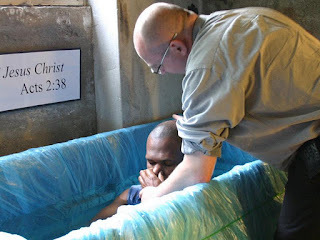 Six received the baptism of the Holy Spirit at the capital church. The Global Association of Theological Studies of Lesotho (GATS-L) presented eighteen graduates their Certificates. The evangelism teams have been going to an area of the country to promote revival. One sixteen year old convert brought eight new visitors for Sunday service. At this new work, five have received the baptism of the Holy Spirit. They are now averaging about eighteen in attendance. During regular services ten were baptized in Jesus' name and four received the baptism of the Holy Spirit. Local church revival reports twenty-two receiving the baptism of the Holy Spirit and ten baptized in Jesus' name. New church plant reports thirty-one receiving the baptism of the Holy Spirit in the first two months. At three District Conferences, a total of 107 received the baptism of the Holy Spirit. Many were also healed and delivered. A new church was opened in another district with twenty in attendance. In two more District Conferences, 110 received the baptism of the Holy Spirit and ten were baptized in Jesus' name. One child who was unable to walk was touched by the power of God, her legs were healed, and she began walking. Many others were healed of their diseases. After the scheduled Seminar on the Book of Acts, there will be the first baptism of about sixty in Jesus' name in the capital city. A new church was dedicated. It is the first UPCI church in the capital city of one of the states in the country. At a Oneness Seminar where twenty-four Trinitarian pastors and church workers were present, eight were baptized in Jesus' name. At a three day End Time Prophesy Crusade, fifty-five were baptized in Jesus' name and 70-100 received the baptism of the Holy Spirit. Five new churches were started during the past month. At a revival seminar in one region, twenty-two received the baptism of the Holy Spirit, fourteen were baptized in Jesus' name, and a new church was constructed. In another region, thirty-six received the baptism of the Holy Spirit and thirty were baptized in Jesus' name. in every church, city & nation! It was such a joy to be back in Malawi along with A-Team leaders Bro. Garlitz and team members, Bro. Zimmerman, Bro. Hurley, Bro. Anderson, Bro. Ackah, Bro. Gordon & Bro. Wright. We were so excited to work alongside Bro. & Sis. Gibbs &; all the national leadership of Malawi for a great harvest of souls! 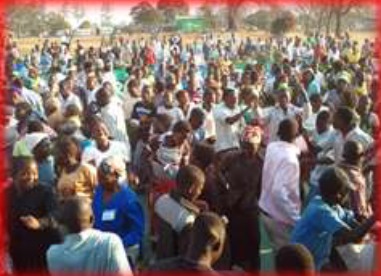 God filled over 400 with the Holy Ghost; there were many baptized in Jesus name and many miracles. We thank the Lord for His mighty power! We returned to Germany & Austria a few weeks ago for the UPC General Business meetings and were so happy to also be back with our church in Vienna! On Sunday, God filled 4 people with the Holy Ghost! In our tent revival in Vienna a few days prior to our return to the field, God filled another 2 with the Holy Ghost in the park. We thank God for the hard work of Bro. Merritt & Bro. Ackah who did such an outstanding job! 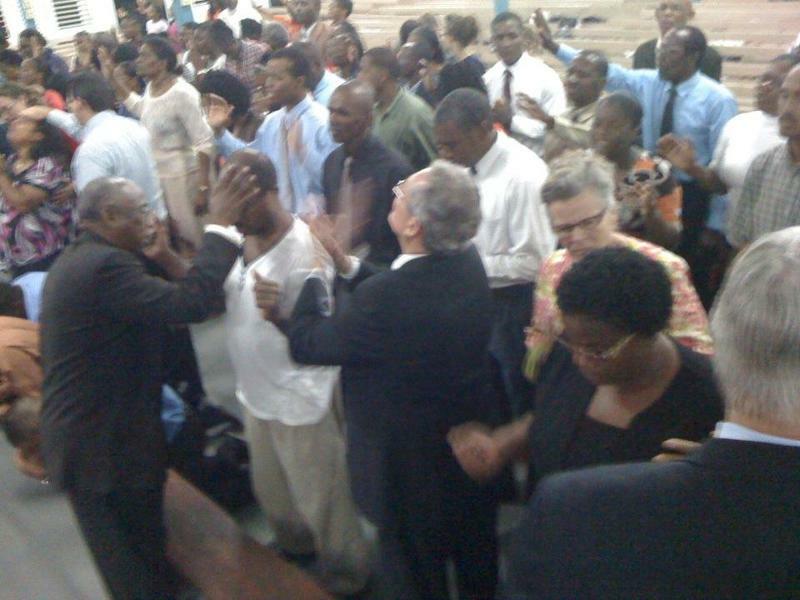 God has filled over 60 with the Holy Ghost! 12 were baptized in Jesus name! A man who had been seeking the Holy Ghost for 30 years was immediately filled! A 10-year-old deaf boy was miraculously healed when God filled him with the Holy Ghost! Thank you to every pastor that opened their church/pulpit to us, prepared for a harvest & gave so sacrificially to get us back to the German speaking nations! 2011 is swiftly coming to an end reminding us that our first your of deputation was blessed. 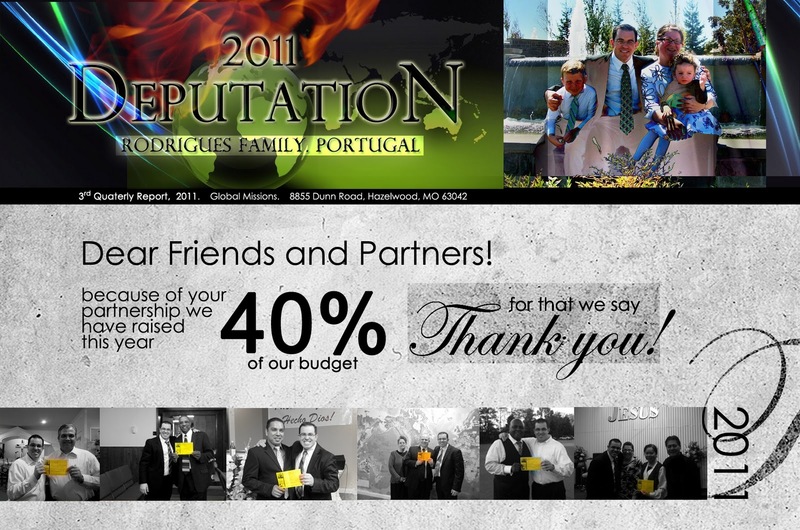 Because of your desire to see this gospel reach the uttermost parts of the world, we will close 2011 with 40% of our budget raised! From the plains of Texas up to Canada and back again, we have seen God's hand upon our life and ministry in a special way. He has filled many with the Holy Ghost; He has healed bodies, families, hearts, and lives; and He has renewed a passion and vision for winning souls in many churches. Thank you, Jesus! We are so thankful for each of you who opened your doors for us to come share our vision and burden for the country of Portugal. The love and hospitality shown to us touched us deeply. We are excited to work together with you for the cause of 12 million souls. Your love, friendship, prayers, and partnership mean so much to us. Our family would like to wish all of you the very blessed of Christmas seasons as we prepare to celebrate the birth of our Savior and King. In spite of a State of Emergency that was restricting the time we could have for the Crusade , 60 people received the gift of the Holy Ghost. Several healings were reported. 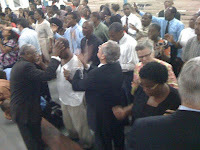 The church in Trinidad really prayed and laboured to see this crusade take place. There were over 200 visitors during the three nights of meetings. We are thankful for the ministry of Bro. 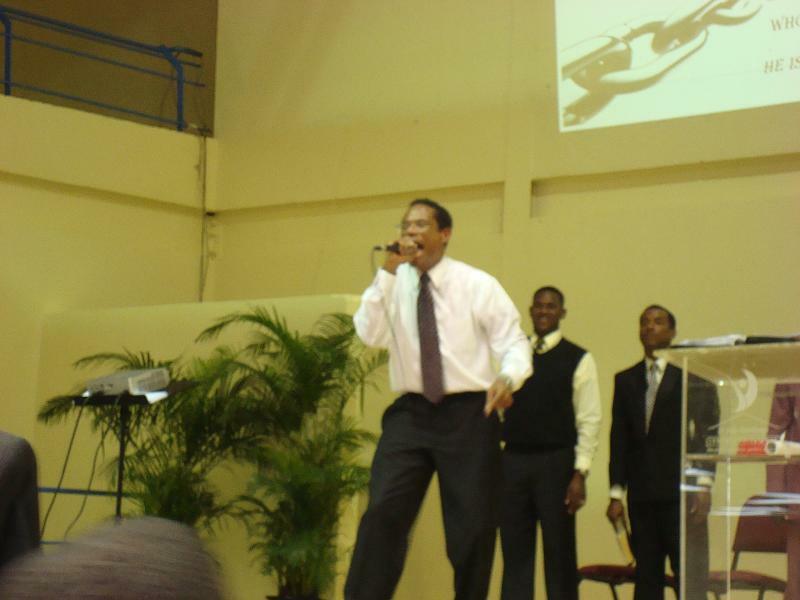 Felix Crowder who ministered nightly. Yes, we give thanks to God for his marvelous work! When you live on an island, you cannot drive to the nearest country to have fellowship. In fact, is is very costly to travel from island to island , so it is always a delight to get together with leaders and saints from all over the Caribbean each year. This year's conference was held in Barbados and was hosted by Missionaries Bro. and Sis. Henry Ritchie and the pastors of Barbados. Bro. 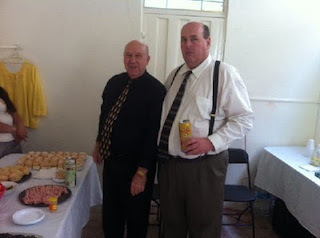 and Sis Hibbert, Bro, Lloyd Shirley and Bro M. Papp were the day speakers, and Bro. Brian Abernathy ministered nighty. God spoke to all of us who attended. Thank you Lord for the opportunity to have fellowship and for all the wonderful brethren throughout the Caribbean. Bro. and Sis. John Hopkins have been the Regional Directors of the CAC Region for the past 8 years. We give thanks for their labor of love in the region. 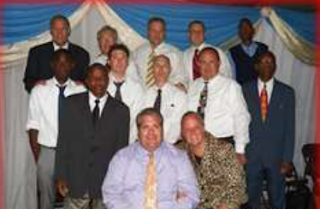 During the Caribbean Conference the missinoaries honored the Hopkins with a plaque. May Jesus bless them always. We also give thanks for the little room we are using in Santurce to begin a work in the Metro area. We visited a contact and, on the first visit, they asked us to have church services there. You have been praying with us for open doors. We are so thankful we serve a God who cares for lost humanity. I will give to the Lord the thanks due to His rightness and justice, and I will sing praise to the name of the Lord Most High. It is hard to believe that Christmas is just around the corner--or feels that way. As I was shopping in E-Mart, I noticed little Christmas trees on display for the first time. Of course, that got my brain spinning in that direction: I wonder how Christmas Choir practices are going, I wonder where they will be singing, I wonder if this will be the year, I wonder what my family will do this year, I am excited that the children are doing a Christmas play this year, etc. As these thoughts flooded my brain, I confess to a bit of homesickness. I sure do miss your faces! So, before I get too far ahead of myself with future holidays, I want to take a moment to say, "Happy Thanksgiving!" I am so thankful for each and every one of you that read this now. You are an important part of my life, and I am forever grateful to you. You have prayed with and for me, you have given of your time and instruction, you have chatted and laughed with me, you have rejoiced and cried with me, you have...you have been (and continue to be) a part of my life. As I reflect upon my list of things to be thankful for, I comprehend again that it is a list I could spend a lifetime writing. During my time in Korea, I am keeping a gratitude journal. Whenever something happens for which I am grateful, I often pull this little book out and make a note. I do not pull it out as much as I ought, but the things on this growing list include magpies, English-speaking children so excited to just say hello, hearing a youth choir singing Dancing Generation in Korean on a street corner, many references to times of prayer and worship, and beautiful weather for a walk along Gapcheon. I am on a mission to connect the young people across the churches in Korea. As an initial foray into this endeavor, I and like-minded folks are scheduling fellowship events for youth in the Seoul area. 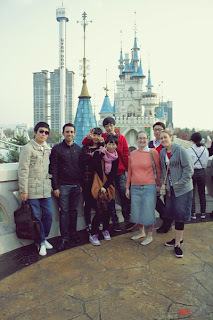 Our first attempt was a trip to Lotte World, a local indoor/outdoor theme park. At this event, we had representatives from 3 different churches. I was surprised to discover that the groups did not know each other at all. For a next event, we want to choose a venue that is more conducive to inter-group interaction. Be in prayer as we continue to plan--for direction and for this mission to spread from person to person. During the month of January, there is the annual youth camp/convention. This event unites youth from across South Korea. I do not yet know whether or not I will be in the country at the time of this large meeting, but many of the young people from my Gwangmyeong church will. By that time and during the meeting, I am praying for a build in the excitement about connecting, praying, and working together with young people all over. The best is yet to come! And, of course, that includes a shift to broader purpose (meeting more than for fellowship). The goal is to engage young people in ministry--ministry that is God-driven. THANKFUL!!!! A young lady with whom I just completed a Bible study will be getting baptized very soon!!! Thanks be to God who does all things well! Thanks be to God whose love is without fail and without bounds! Thanks be to God who made a way for whomsoever will! All glory and honor is due unto his name! This month Pastor Kote, Rev. Irakle Toria, and I were blessed to attend the area ministers conference in Kiev, Ukraine. It was such a blessing to see all of our brothers representing the former Soviet Union gathered together in worship of the one true living God. Pastor Woodward of Canada ministered to our hearts, and God renewed our strength. We were deeply touched by the worship and ministry this year and look forward to seeing everyone again next year. After talking with Pastor Kote about trying to raise funds for building our new facility, I was surprised when he held a faith promise service the following Sunday. Pastor Kote knows nothing about faith promise, but he approached the church with the need and they responded in faith. Every person that gave in the building fund received raises or new jobs. God has multiplied the gift they gave in faith. I would like to bring to you attention our building fund. Right now, we have been given 16,737 square feet of land to build on. Unfortunately, our building fund has about $900 in it the last time I checked. I am praying that God would move 400 people to give $100 towards our building fund. This would build our Bible school, as well as our headquarters church in Tbilisi. The church here raised an unprecedented $500. With 80% unemployment that is a miracle. Imagine what you could do without to see the kingdom grow. I pray that God would touch your heart again with the need of your brothers and sisters in Georgia. I thank you for being apart of what we are doing here in Georgia, and thank you for all of your support and prayers. As the time has come to submit both a newsletter and prayer focus, we chose to make this email a dual-purpose one as it will save all of us some time (smile). Thank you in advance for understanding. We have been praying for TEAM FINLAND, our family, and our friends, and hope that all of you are doing well and being blessed. Language Study - Tarvitsemme paljon rukousta. Suomen on vaikeaa. We need much prayer. Finnish is difficult. It is a goal that we will achieve! We know that it is possible, because other many foreigners have learned to speak the language. Your continued prayers for clarity and understanding will go a long way in helping us get past some of the mental hurdles that we face on a daily basis. Bible Studies - We are continuing to teach those who are hungry to learn! Pray that all involved would have spiritual understanding and wisdom. Learning about God and His Word is eternally important, and we want to do all that we can to offer the right information at the right time. Miranda - She is continuing to assist the church in Copenhagen, Denmark as AIM until mid-December. We are praying that God shows her what steps to take as she makes plans for the future here in Finland. Additionally, she has been sick numerous times since arriving in Denmark, and needs a spiritual covering from infirmity. Candace - Her school load is very heavy. In addition to her 12th grade studies, Finnish class requires 4 hours of class time each week in addition to a 'pile of homework.' She needs a covering of peace for her mind in the midst of the stress she faces on a daily basis. Holidays are approaching - As the time for year-end celebration draws near, one's heart and mind tends to drift towards family. We ask for your prayers as we make plans to celebrate our first Thanksgiving and Christmas in Finland. Additionally, this will be the first Thanksgiving that we will not celebrate as a whole family, as Miranda will be in Denmark. Thank you in advance to those who understand 'distance between loved ones' and pray for this need. 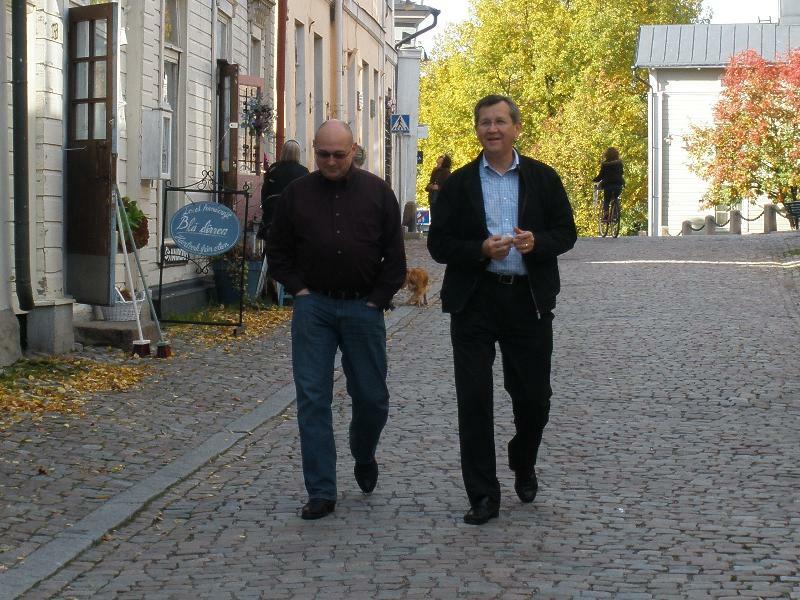 Planning for 2012 - We are in conversation with a number of people regarding missions trips to Finland. We need wisdom regarding these activities. In September, we were introduced to Douglas by Joe, a young man who experienced salvation in Germany. Joe had been talking to Douglas about the Lord, and revelation was received regarding baptism. They made the 2-hour drive to our home, where we were honored to baptize Douglas in the wonderful name of Jesus. Douglas also received the baptism of the Holy Spirit shortly thereafter! It was altogether humbling and awesome to experience this within our own home. Thank you, Jesus, for another soul added to the rolls of glory! As of this writing, we have just completed our fifth week of classes. It is an intense course that requires many hours of independent study. Thankfully, our teacher is patient and willing to answer any and all questions that we have for her! We have also enjoyed establishing new friendships with our fellow students. Thank you to those who joined with us in prayer regarding a viable option for learning - He answered! And, to those who support us in finance, thank you for enabling us to achieve this goal. On Sunday afternoons, we have a group meeting in our home and enjoy a visitor about every other week. God said in His Word that where two or three agree, He is in the midst of them. We are grateful for His Presence, for it is always in our home, but during group meetings He inhabits our praise in such a sweet and gentle way. We are not dismayed that our number is small, for everything happens in His time and season, and our family is excited about offering opportunities for others to enjoy His presence with us. At the close of September, we enjoyed a visit from Robert and Jerolyn Kelley, our Area Coordinator. It was truly a pleasure to become more acquainted and share a part of our beloved country with them as well. 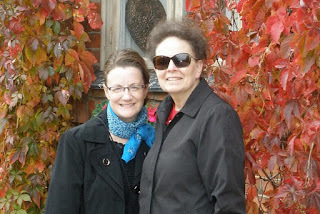 The time of fellowship revealed a past connection: Glenda grew up in the church that both Bro. Kelley's sister's husband (Rev. James K. Stewart) and Sis. Kelley's grandfather (Rev. George W. Chambers) pastored in Columbus, Ohio. Glenda's father had also taught Bro. Kelley's Sunday School class. It Robert Kelley-Mark Alphinwas fun to recount the memories of days gone by! The Kelley's intercessor team in Scotland has been upholding us in prayer since we arrived in Finland, and especially since we began language studies. It has been of immense strength to us! We are very thankful for the Kelley's and their ministry, greatly appreciate their support of our family, and look forward to working with them to reach our region. Last week, Miranda's computer ceased to function and it appears that she will need to purchase a new one as soon as possible. Currently, the AIM funds available in her account will not cover this expense. If you are able to assist in defraying the cost, we know that she would appreciate it. Thank you in advance for considering Miranda's need. It is urgent, as she is assisting Pastor Chris Brett in Copenhangen as Executive Assistant. 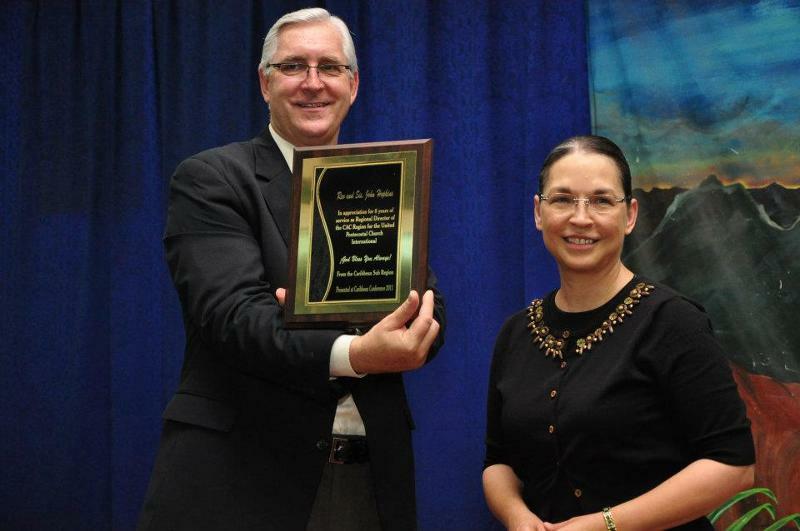 Additionally, she volunteers for UPCI Associates in Missions as Managing Editor of their e-newsletter. It is impossible for her to complete either of these tasks without a computer. For over four years it has been my privilege to serve as your AIMer to the United Kingdom, in Scotland, and travel to some awesome congregations throughout the UK! In the past few months, I have shared some incredible moments in the presence of the Lord in Glasgow, Scotland, where I serve on the pastoral team. 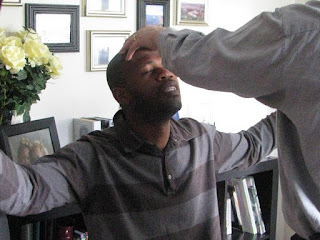 In Dublin, Ireland, during an outreach, 7 people received the Holy Spirit, and 10 were baptised! I was part of the worship team for UK General Conference 2011 in Llandudno, Wales! God has been with us in a mighty way in services in Leeds, Liverpool and London, England, as always blessing hearts that hunger and thirst after righteousness. We held a Missions Rally in Kemnay, Scotland. We are starting an extension work in Hamilton, a suburb of Glasgow! 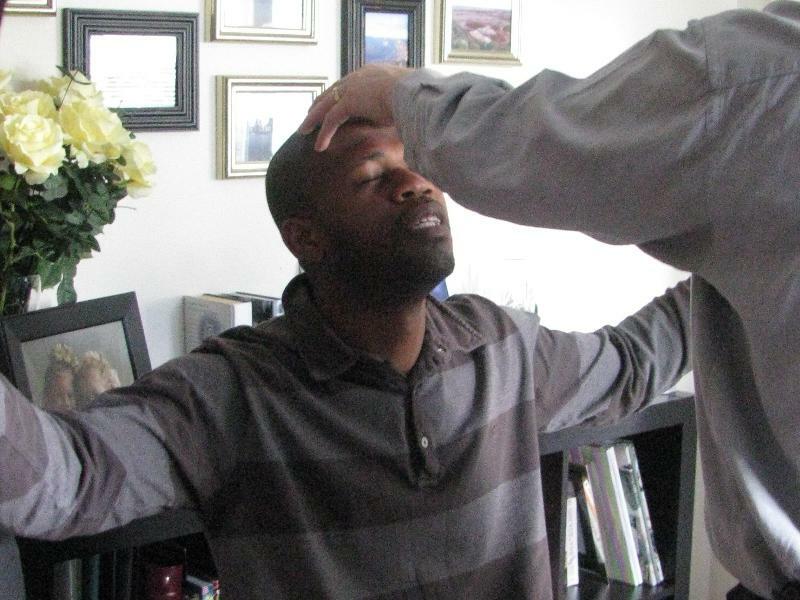 We are seeing God bless His people with miraculous healings in an unprecedented measure in the United Kingdom! Young people are laying hands on the sick, and they are being healed instantly; they are operating in the gifts of the Spirit, they are preaching the Word, and souls are being saved as they allow Jesus to use them!